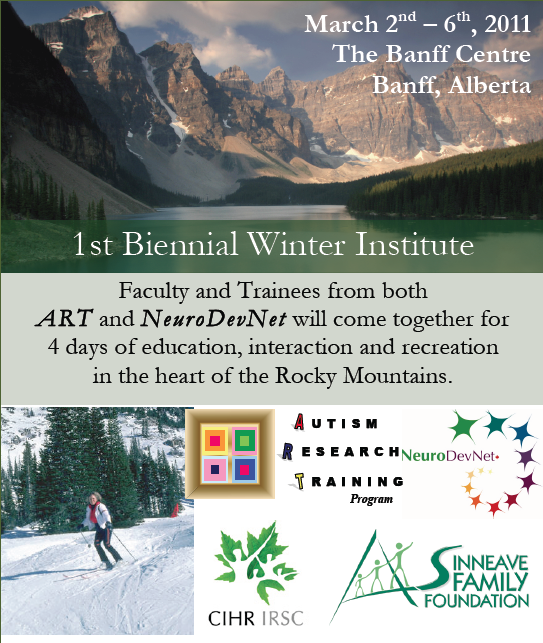 I did not, as I had previously hoped, attend in Banff Alberta for the Autism Speaks National Autism Strategy discussions which were taking place during the NeuroDevNet and Autism Research Training (ART) Program first Biennial ART-NeuroDevNet Winter Institute March 2-6. Circumstances, including limited flight options out of Fredericton, did not permit me to attend in person. I did participate, by teleconference, in the 2 hour National Autism Strategy/Advocacy program sponsored by Autism Speaks Canada. I do not know what Autism Speaks Canada will take away from the input it received. These are some of my thoughts, some of what I took away from the discussions. First, I commend Suzanne Lanthier of Autism Speaks Canada for her impeccable courtesy and professionalism both in organizing the event and in moderating the discussion group. It is easy to see why Autism Speaks has engaged Suzanne as their primary representative in Canada. She is very focused and informed. Autism Speaks Canada itself though has not been a player in the drive for a National Autism Strategy which has taken place over the past 10 years. Autism Speaks Canada does not speak for the parent advocates in various provinces including here in New Brunswick who have fought for provincial services and for a National Autism Strategy. Any effort by Autism Speaks Canada to form a National Autism Strategy must be consistent with the efforts made by parents who have long fought for such a strategy. Otherwise there will be several boats rowing in different directions, not one boat with all rowing together in one direction, as the hope was expressed during the discussions. Second, I was also impressed with Mike Lake, an Alberta MP and father of a 15 year old child with an autism disorder. Mike Lake and I are diametrically opposed on issues of National Autism Strategy but he did take 2 hours from an undoubtedly hectic schedule to participate in the Conference. He was impeccably polite and articulate and made his argument very well. Essentially though Mike Lake's argument is the argument of Stephen Harper and the current version of the Conservative Party of Canada which says that autism falls within provincial jurisdiction and it is the provincial governments which must implement policy with respect to autism issues in health, education and social development. As a lawyer I understand the Harper/Lake argument but the historical fact is that Canada has not limited itself to the hard confines of strict jurisdictional walls. Cooperative federalism has existed for many years to permit federal efforts to address issues that take on a national scope. The National Health Care Act itself is a prime example of cooperative federalism. The National Health Care Act would not exist at all using the Harper/Lake logic. In Canada our federal government has stood back and watched as more and more autistic children are diagnosed with autism disorders with current, reliable US, figures estimating 1 in 110. Cooperative federalism is required in the form of national legislation to authorize the federal government to provide funding for necessary evidence based treatments and services and to ensure that the funding is used for that purpose in each province. Across Canada there are inconsistent and varied early intervention programs in place to help autistic children. Apart from New Brunswick it is not clear that any other province has integrated autistic children into neighborhood schools in accommodated learning environments within the schools and with autism trained teacher aides and resource teachers when appropriate. Our autistic children are also becoming adults and for those with severe, classic autistic disorder who are low functioning and intellectually disabled there is a crying need for decent residential care and treatment. If our national government refuses to get involved many autistic Canadians will be denied a decent life. They will have been abandoned in the name of frigid, hard constitutional rigidity. If Canada is to have a real national autism strategy it must consist of more than surveys and internet information sites. It must be one which ensures that all Canadian autistic children and adults have access to evidence based treatment and education. A real national autism strategy will be one which commits the federal government, through Federal legislation, to work directly with the provinces to ensure that all autistic Canadians have access to evidence based treatment and education and to decent residential care and treatment. A national autism strategy which does not focus on these goals will not help Canadian children and adults with autism disorders. If a national autism strategy is not focused on achieving such goals it is a sham, a mockery of the desperate needs of many autistic Canadians and their families. Amen Harold. Thanks for your efforts.